BANGKOK, Sept. 24, 2018 /PRNewswire/ — Ministry of Foreign Affairs unveils the Thai government’s efforts in fight against illegal, unreported and unregulated (IUU) fishing in the country, with the battle being waged on many fronts simultaneously. It is worth highlighting some of them. A strong legal framework is an essential foundation for the Government’s endeavours and, in this regard, a new law was passed in 2015 governing the entire fisheries sector. Furthermore, necessary amendments to existing legislation have been made and over 100 new implementing regulations have been enacted. This comprehensive legal reform of the fishing industry has enabled the Government to gain complete oversight over fishing activities, while also providing the tools to punish violators of the law. In terms of traceability, the Thai authorities have put in place systems to trace the origins of marine animal catches from both inside and outside Thailand. 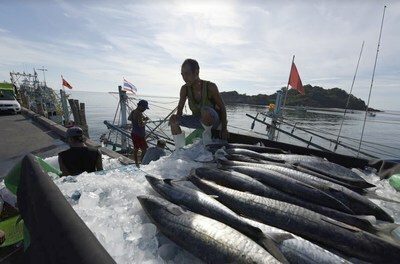 In particular, two new electronic databases have been developed to strengthen Thailand’s national traceability system. This is aimed at ensuring that no IUU aquatic and fisheries products can enter the Thai market and production chain for exportation. Central to the Thai Government’s fight against IUU fishing is law enforcement, and rightfully so. Special Arrest Teams have been formed to instigate more arrests of offenders at sea. This is augmented by the use of aircraft and unmanned aerial vehicles to conduct air surveillance in conjunction with sea patrols by an undercover vessel. It must be noted that the Thai Government’s vigorous law enforcement efforts and expedited prosecution process have resulted in a total of 4,448 IUU or human trafficking cases being brought before the Criminal Court since May 2015, with almost 90 percent of them being concluded and prosecutions made. This has led to numerous convictions and hefty fines. As can be seen, significant strides have been made over the past three years in Thailand’s efforts to prevent, deter and eliminate all IUU fishing in the country. Nonetheless, the Government would be the first to admit that more remains to be done. It is generally agreed that there can be no letting up in the Government’s efforts until the ultimate goal of an IUU-free Thailand is achieved, with sustainable fisheries ensured for future generations.